1.) How Carter Page got tangled in the Russian web. Sergey Aleksashenko who was also Former Deputy Chairman of the Central Bank of Russia!! 6.) As mentioned Sergey Aleksashenko is also a senior fellow at the Brookings Institution. The Brookings Institution is nothing short of a foriegn lobbyist think tank trying to influence foreign policy around the globe! 7.) Interesting to note: #JimBaker a top FBI lawyer who was reassigned in late 2017 after being linked to a journalist who wrote about the so called "#TrumpDossier," is reportedly looking to join & did join the #BrookingsInstitution. 8. )Aleksashenko happened to also be the boss of Alexander Torshin at the Russian Central Bank between 1995-1998. In 2013 Torshin was indicted by Spanish authorities for money laundering. 9.) This is where it gets interesting. Maria Butina served as a special assistant to the deputy governor of Russia’s central bank, Alexander Torshin, a former Russian senator belonging to Vladimir Putin’s political party. Another interesting note with regard Carter Page is that he's a Member of the Counsel on Foreign Relations. 13.) Victor Pinchuk's relationship with Carter Page is said to led to the expansion of Merrill Lynch Russia in Moscow! NEW Report: Russia's Internet Research Agency—charged w/ criminal offenses in the 2016 campaign—"sliced Americans into key interest groups for targeted messaging. 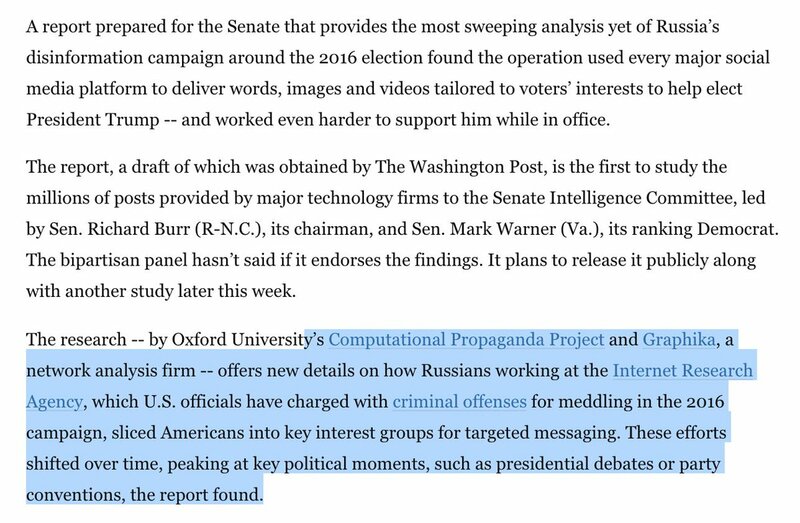 These efforts shifted over time, peaking at key political moments, such as presidential debates or party conventions"
Computational Propaganda Report on Russia's 2016 election disruption operation: ALL the messaging clearly sought to benefit Republicans & specifically Trump. Targeted Right-wing voters to encourage them to back Trump. Distracted, confused & discouraged others from voting at all. 2/ This is further evidence of the credibility and importance of the Steele dossier, which alleged that Page did have secret talks in Moscow. Steele’s sources, however, told him that the talks were with Sechin, the head of Rosneft, the Russian Federation’s giant oil company. Page rants about the “Dodgy Dossier, corrupt Obama Administration” & blames USIC for damaging him & Team🇷🇺Trump.